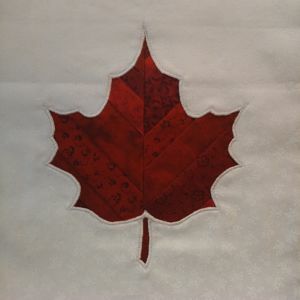 The maple leaf block is made with reverse appliqué, satin-stitched over a strip-pieced patchwork block – a technique I call “Peek-a-boo Appliqué“. It occurred to me that reverse appliqué over patchwork would add unexpected detail to an appliqué design and be much easier to execute than trying to turn under the edges of patchwork using traditional appliqué techniques. The result looks like patchwork appliqué! 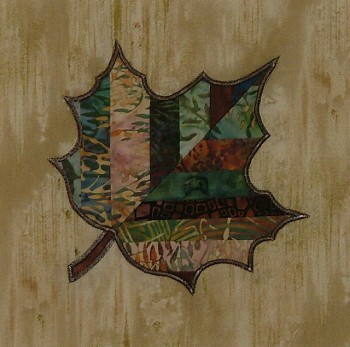 My first maple leaf block was made using multi-color batik fabric strips, for a more autumnal look. 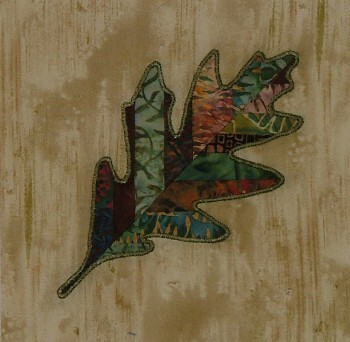 The same fabrics were used to make an oak leaf block. 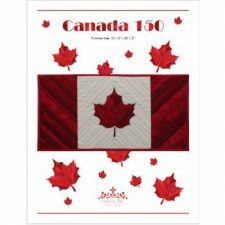 As I will be teaching this Peek-a-boo Appliqué technique at Quilt Canada 2017 – the year of Canada’s 150th birthday – I thought it might be fun to make the block again using red fabrics. From there it was only a short step to add some more strip-piecing to the edges and make a Canadian flag. The finished size of the quilt is 10-1/2″ x 20-1/2″ – a nice size for a wall quilt or place mat. 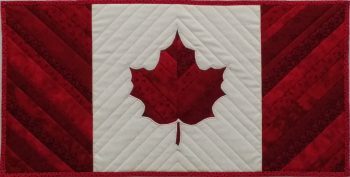 The pattern includes full-color, step-by-step instructions for strip-piecing, appliquéing the maple leaf block – including my technique for mitering the points with satin-stitching – and assembly. For more information about Peek-a-boo Appliqué and satin-stitching techniques, come visit me at Quilt Canada 2017 or contact me to set up a workshop in your area. Thanks Andree! The pattern has step by step instructions for the reverse appliqué but let me know if you have any questions. Hi Kathy, I’m really looking forward to making your pattern. I’ve only done one reverse applique but really liked it.